To add or subtract polynomials, remove parentheses if any are present, and combine the like terms. Remember to be careful of the signs. Some people prefer to use a vertical method when adding or subtracting polynomials. Line up the polynomials so that the like terms are one under the other. It may be necessary to insert a 0 place holder if a term is missing. Algebra Tiles: Algebra tiles give you a "visual" understanding of the process of polynomial addition or subtraction. Remember that red tiles represent negative values. 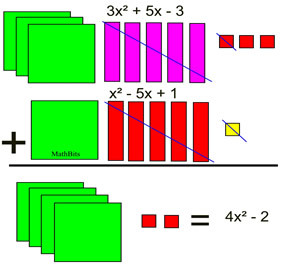 See more about Algebra Tiles. This example shows placing the trinomial in standard form (powers listed in descending order) before adding. Notice how the terms were lined up under like terms. Again, notice the order of the subtraction. Change the signs of the terms being subtracted, and follow the rules for adding signed like terms. In this problem, we insert 0x to hold the missing column for x.